Each of these units are color coded with reflective and vibrant paint colors that will help you distinguish them from a distance. This was important that we use textures for this purpose, because creating unique silhouettes would be expensive not only in development time, but also in polygons. 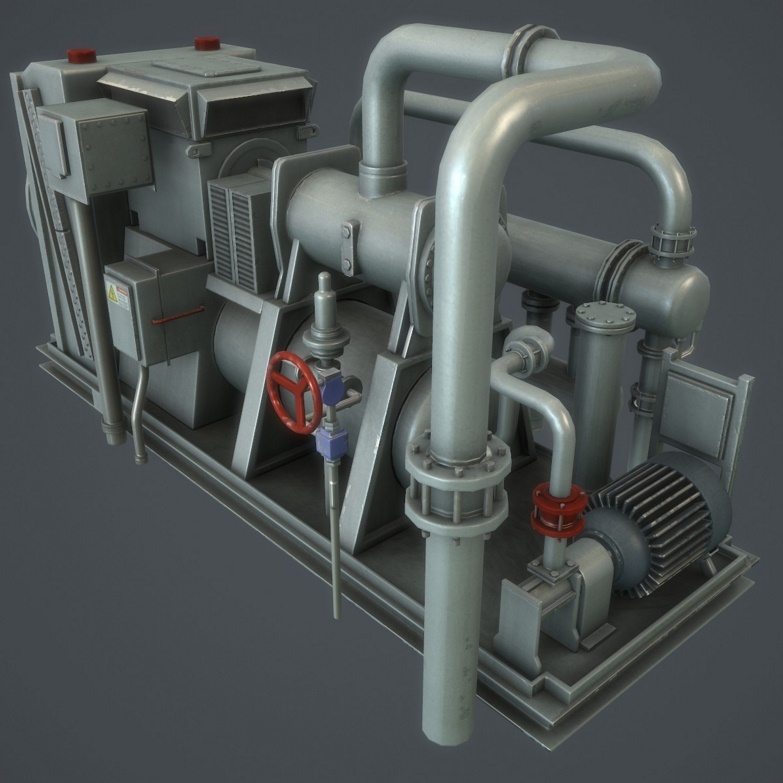 Obviously the machines each have their own style, but mostly we are just swapping out the diffuse textures to change the colors since all three units are utilizing the same normal, specular, and gloss textures. As you can see, we have added a control hub to the front of each module. This is where you will normally approach the machines, and interact with the control panel. 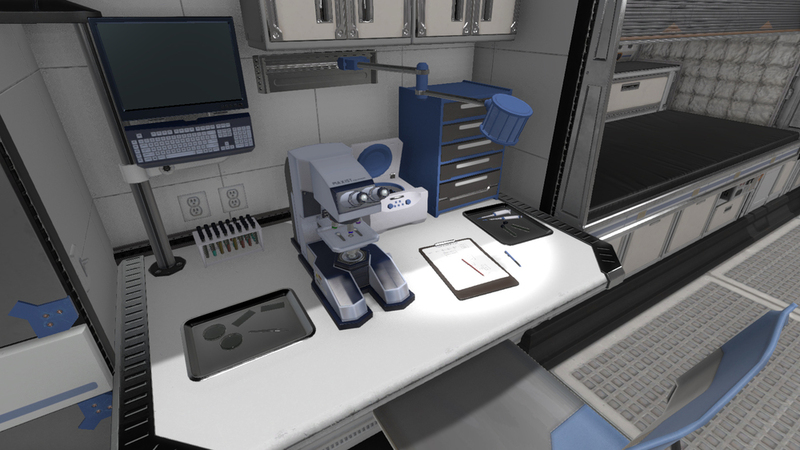 From here you will be able to perform diagnostic checks from your datapad. You will also be able to download documentation about possible repair procedures. Sometimes you will be required to shut off the power to the machine prior to doing these repairs, so you may have to perform your work fast before the Habitat loses too much heat or oxygen. When you open the panel you will be presented with multiple components, each corresponding to different types of repairs. You will need the correct pieces of equipment to perform the repairs. For this example you would notice that one of the fuses is burnt out in the bottom left portion of the panel, so you would need to remove that fuse and replace it with one from your inventory. 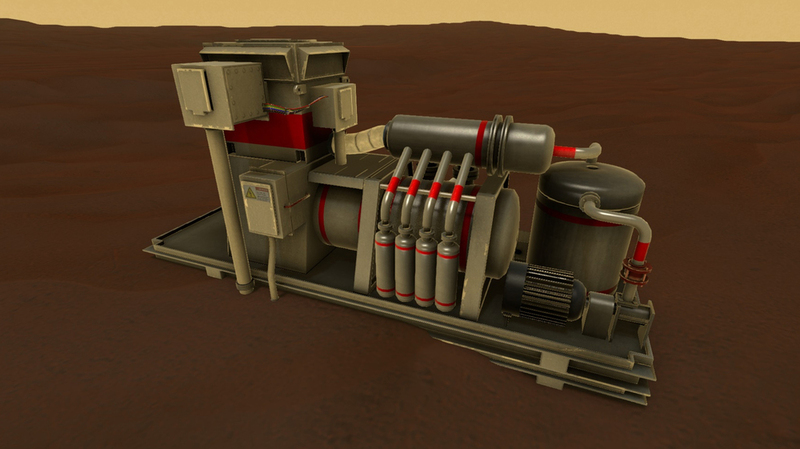 Obviously the texturing for these internal components is not complete, but you get the idea. There will be many different pieces and repairs required for these units, but after some practice you may start to learn the quickest ways to fix them. Or better yet, you may be smart enough to run diagnostic checks regularly to repair possible issues before they ever occur. 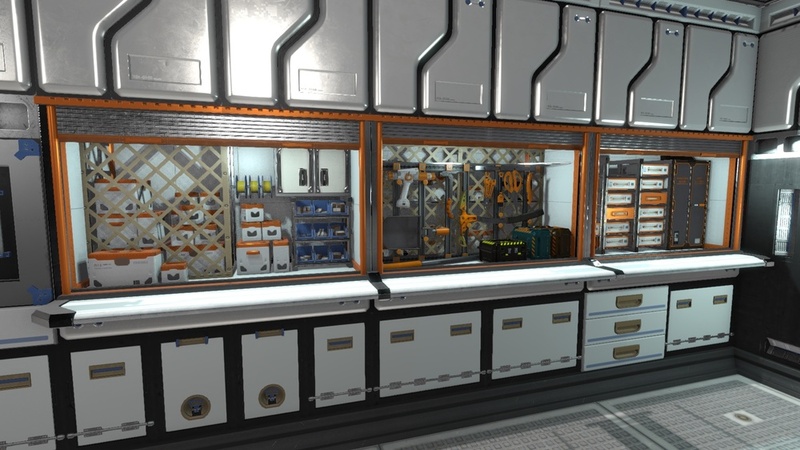 We now have most of the other components complete as well, including power switches, solar panels, and the bulk of the heater, oxygenator, and water reclaimer. 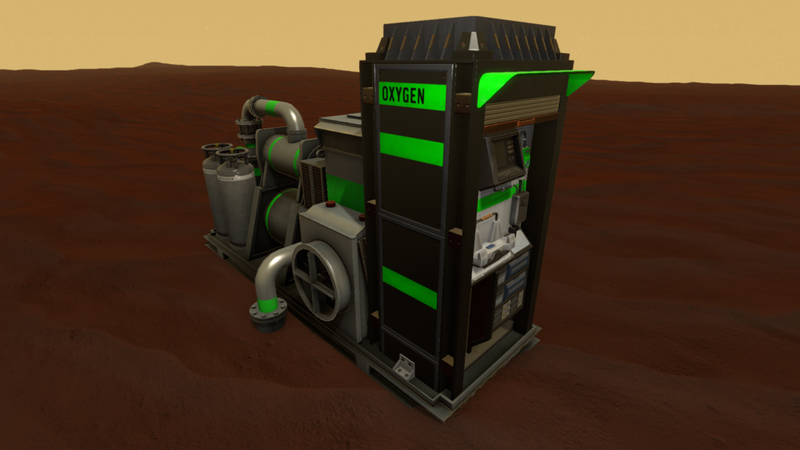 The heater, oxygenator, and water reclaimer (above) are the three main life support systems at Foundation Base that will require monitoring and occasional maintenance in order to survive. 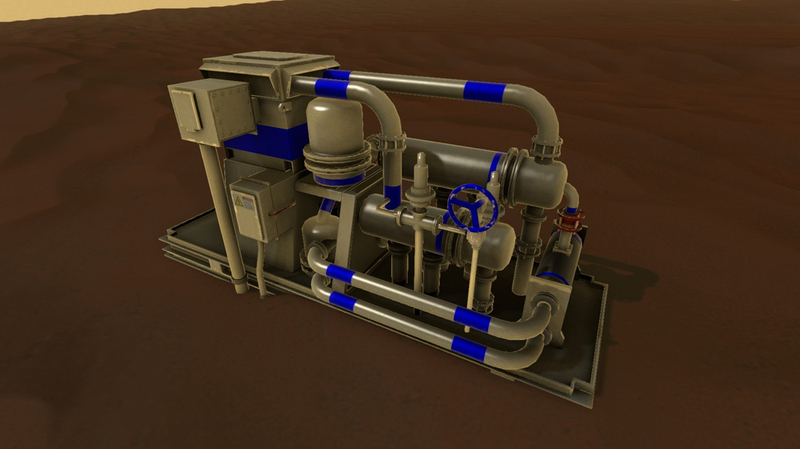 These exterior modules run heat, oxygen, and water through buried lines back to the Habitat. 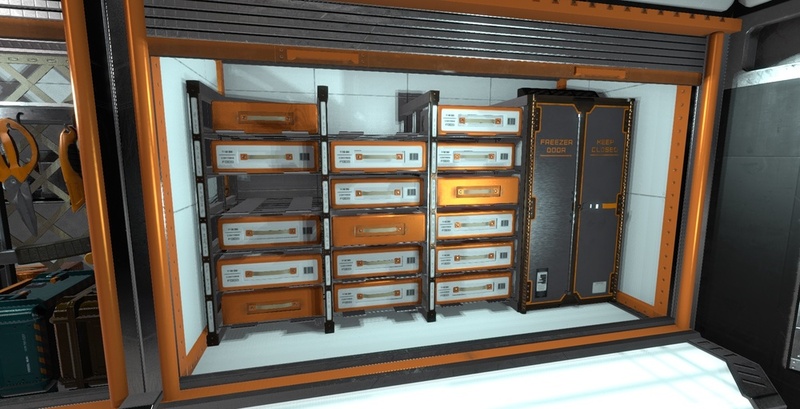 The modules themselves are separated from the Habitat, each with individual power sources to prevent full power loss to the most vital survival components. The separation of these units ensures that any explosions or overheating that may occur in these machines will not affect the safety of the Hab. There are a few different ways to power these machines, and monitoring their power sources will become just as important as making sure the machines themselves are running properly. Currently, we have three types of solar panels that are the most common source of power to the exterior modules. The larger solar panels require more materials and time to craft, but offer greater power efficiency. Each bank of solar panels will be positioned near a switch that controls the flow of electricity generated from the panels to their corresponding machine. Color coded flags mark the path to the machine being powered. The power switch is needed to perform maintenance on the machine. If something needs repair, you may be required to shut off the power source using this switch and then replace a part on the machine before turning the power back on. We are excited about the many variations of repair work that will be necessary with these new modules in place. Next we are working to create a hub attached to each module that can be opened like the hood of a car to perform part replacements for the fuses, pumps, and other inner workings of these machines.